Burger King had some of the most colorful and interesting displays during the vintage era. And they sold enough Star Wars glasses to fill up every collector's eBay and Craig's List searches forever. Surprisingly though, never before seen store displays from the restaurant are still showing up. 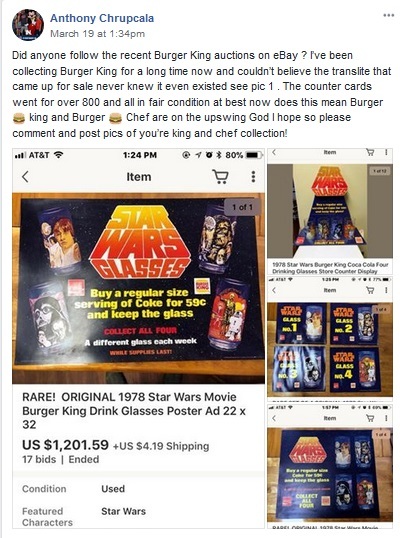 In this thread from the Star Wars Displays and Advertising Group, a recent auction of BK displays is discussed, including a translite which collectors have never seen! Han Hoth Has a Holster! Many of the more creative kids realized that the Han Hoth action figure has a functional holster. 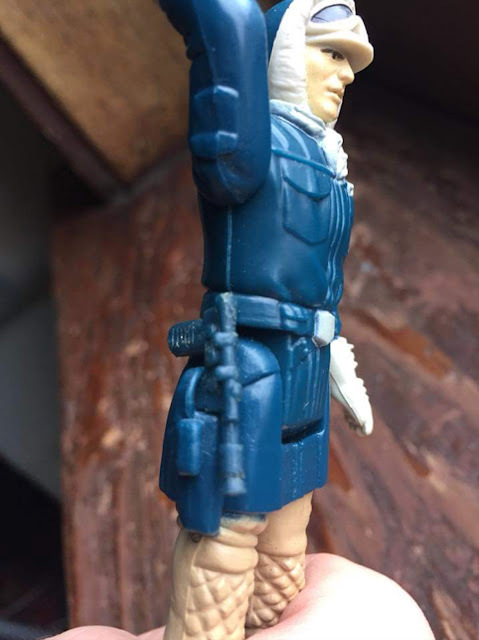 In this thread from The Imperial Commissary group, collectors debate if this feature was sculpted purposely or whether it was a happy accident. Other less known action figure features are discussed as well, including the swiveling claw arm on FX-7 and the functional backpack on Leia Boushh. 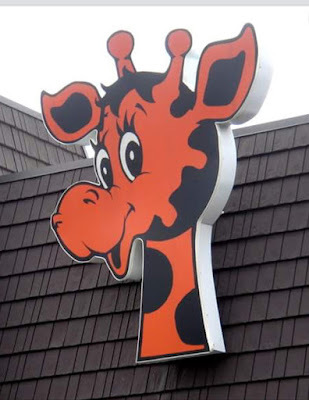 With the recent announcement of the upcoming closing of Toys "R" Us, there has been an increase in appreciation and nostalgia for the mega toy store franchise. 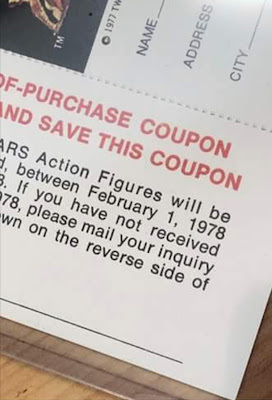 The previously much maligned large orange price stickers, which often obstruct a portion of the cardback imagery, are given their due as a piece of toy history in this thread from the Empire Strikes Back group. 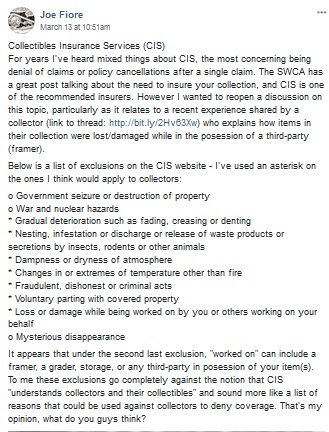 With the skyrocketing values placed on Star Wars collectibles, the Empire Strikes Back group discusses options for insuring a collection. The discussion includes the benefits and risks of using a pre-existing home owners or renters insurance policy as compared to taking out a collector specific insurance policy. An Early Bird Certificate with a different perforation pattern is found and is compared to known original examples in this thread from Star Wars 12 Backs and Early Vintage Collectors Group. The authenticity of the certificate is evaluated by collectors. While technically a thread from 2016, it was bumped last week because of the recent RocketFett auction results. And since it's a relatively slow news week, we will count it as a current event (especially since it's awesome!). 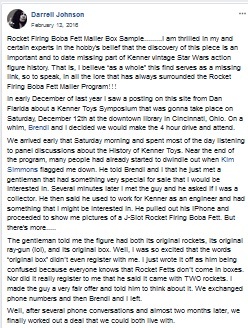 The thread does a good job of explaining what it's about, but to put it simply: a member of the community found a vintage RocketFett in an original mailer box. Exactly how it would have been shipped to kids, had the mechanism not been removed. If that doesn't make you want to read about it, I don't know what will. The Continuing Saga of People in the 80s Trying Desperately to Explain Luke and Vader's Relationship. In this week's episode: Vader is Luke's Mom! 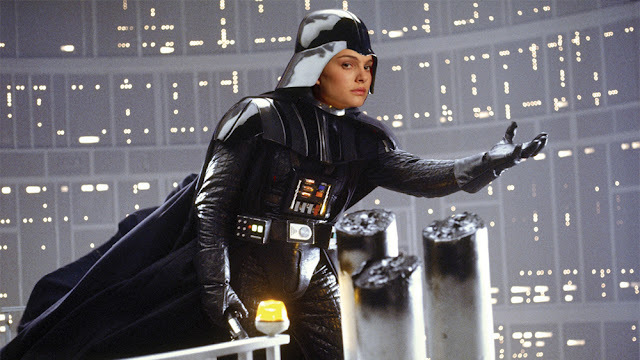 Darth Padme. She hates sand too, but mainly the emo guys who keep whining about it all the time. The 1980s came up on people fast. They were just finally getting used to it being the 70s, and then all of a sudden that effort was wasted. The surprise details of Luke's parentage were just the start of what would undoubtedly be a decade of baffling mysteries for the public. As the geeks, soldiers, future millionaires, and university professors who made up the then fledgling ARPANET sat around and looked for something to talk about on their futuristic electronic gizmo (it's like HAM radio! But for written things!) the fact that Vader was Luke's father was one of their absolute favorite topics to dwell on. As we've seen in past issues of the Community Digest Time Capsule, anyone who had a theory, access to computer equipment then worth tens of thousands of dollars, and had five minutes to kill, would launch into detailed explanations as to why Vader couldn't be Luke's father. (Because why not? What else are the country's greatest minds going to talk about using the most astonishing technological leap in humankind since the printing press? Nuclear disarmament? Heck no! That's not what the internet is for! The internet is for venting about plot twists in movies you don't like, making obscure Tolkien references, and rating the attractiveness of TV stars.) Most of the arguments as to why Vader wasn't Luke's father hinged on actual lines of dialogue from the films, and the conclusion would be kind of reasonable... if Lucas cared at all about that. But in a space opera, everything is merely transitory, always in motion until something better comes along. But in 1982, before the release of Return of the Jedi settled the matter forever (no one argues with Yoda, that puppet can solve paternity questions faster than Maury Povich), fans could still log onto the net-sf.lovers newsgroup and dream. Let their imaginations run wild, trying desperately to explain how it could all make sense, no matter your point of view. Among the most interesting theories you'll see presented in that proto-internet community: Darth Vader is Luke's mother! Case closed! The evidence is all there, people! Get your heads out of the sand (it's course, irritating, and it gets everywhere)!